The concept of Jihad in Islam is one of the topics that causes the most confusion and is surrounded by a loud cacophony aiming at equating Jihad with mass murder and random shooting sprees. All concepts have roots in a group of beliefs that nourish the concept into full bloom. By applying this definition on Jihad, we would find that its roots are not the same as what infamous propaganda would have us believe; that Islam instills bloodlust and a desire to terrorize people and massacre them in cold blood or convert them at the point of a sword. The roots of Jihad are in Islam and to understand the concept of Jihad we need to take a broader look at the message of Islam and the messenger who carried it from heaven to earth. Muslims consider the Prophet Muhammad to be the carrier of the last revelation from God to all mankind. This idea gives rise to the universality of Islam which does not confine itself to a certain place or limit itself to a specific time and more importantly does not target a particular race or ethnicity; be it Arab or Turk or Anglo Saxon or Asian. The reality is that Islam transcends the boundaries of space, time and race to encompass all of humanity in its fold. The most important characteristic of the Prophet Muhammad, which is mentioned in the Holy Qur’an, is that he is a “mercy” to the worlds. The idea that the Prophet Muhammad was sent by God to be a mercy to the worlds reinforces the universal characteristic of the message of Islam as the Prophet is not a mercy to Muslims alone but to all people, animals, plants, stones, indeed to all creatures; this is what is meant by “all the worlds”. This overarching characteristic of the Prophet being a mercy to all the worlds encompasses all the concepts and / or the ideologies which is stem from Islam and are promoted by it, including the concept of Jihad. 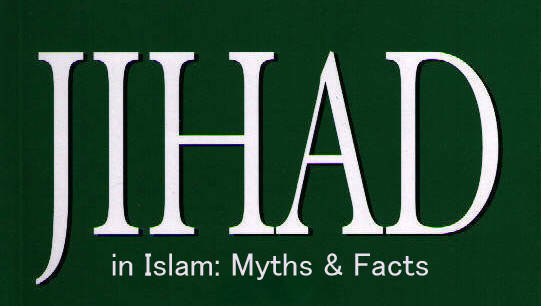 The Linguistic Origin of Jihad Before delving deeply into the concept of Jihad, it is vital to define the term Jihad and its root in the Arabic language. The word Jihad comes from the root j / h / d, which in Arabic means to exert the most effort. This definition is general as one can exert effort in studying or fulfilling goals and ambitions in a variety of areas. In Islam the idea of exerting effort has two levels, a major level and a minor one. The major level of Jihad is jihad al-nafs or struggling against one’s lower self and its demeaning lustful desires. This Jihad is the hardest because it needs discipline and hard work. The lesser, or minor Jihad, is al-qitaal or armed struggle. This is the Jihad that has been attacked by unjust and misleading propaganda in an effort to equate it with mere bloodshed. Qur’anic Verses and Prophetic Traditions on Jihad Keeping in mind the concept that “mercy” is the backbone and root of all Islamic legislations and rulings, one must understand that Jihad is no different. God in the Qur’an and the Prophet Muhammad in his prophetic traditions have laid out the purpose of Jihad and set the rulings and foundational bases which condition this concept and through which it can be defined as Jihad. Suleiman Ibn Burayda narrated through his father that whenever the Prophet used to send an army to battle, he would brief its commander and remind him to fear Allah in his actions and those with him and say: “Fight in the name of Allah, fight those (who fight you) from among the disbelievers and do not exceed your limits, do not transgress, deceive, mutilate [the dead] and do not kill a child.” [Al-Tirmidhi]. Ibn ‘Umar (may Allah be pleased with them both) said: “I saw the messenger of Allah (pbuh) circling the Ka’ba saying: ‘How great and sacred you are, and how pleasant your fragrance! By He in whose hand is the life of Mohammed, the sanctity of a believer, his property, life and to think well of him is greater in the sight of Allah than yours.’” [Ibn Majah]. Consider also: “The first cases to be adjudicated against on the Day of Judgment will be those of bloodshed.” (Bukhari), and his strikingly stark threat that: “Whoever kills one (non-Muslim) under contract (of Muslim protection) will never smell the scent of Paradise.” (Ibn Majah). • Self defense and fighting back against aggression. • Alleviating religious persecution and establishing freedom of religion so that people may have the opportunity to think freely and practice their religious convictions. • The nobility of purpose, meaning that no personal interests or private gains should be the aim behind which Jihad is being waged. • Fighting should be only against warriors not defenceless civilians who are not in the battlefield and are not equipped or trained to be engaged in combat. • The killing or harming of women and children is strictly prohibited. Al-Bukhari and Muslim reported through Abdullah ibn Umar (may Allah be pleased with them both) that a woman was found dead in one of the battles fought by the Prophet (pbuh); thereupon he condemned killing women and children. Another phrasing of the hadith states: “The Messenger of Allah (pbuh) forbade killing women and children.” Imam al-Nawawi said: “There is a scholarly consensus on putting this hadith in practice as long as the women and children do not fight [the Muslims]. If they do, the majority of scholars maintain that they should be killed.” [Sharh Muslim 12/48]. • Preserving the lives of captives and treating them humanely. • Preserving the environment which includes the prohibition on killing animals or cutting trees or destroying harvest or polluting rivers or wells or demolishing houses. • Preserving religious freedom for worshippers in their homes, churches or synagogues. • Killing and attacking people by surprise is prohibited. Abu Hurairra (may Allah be pleased with him) narrated that the Messenger of Allah (peace and blessings be upon him) said: “A believer is not to kill [others]. Faith is a deterrent to killing.” Ibn al-Athir said: “Killing [here] means taking others by surprise and killing them while they are unprepared.” [Al-Nihaya fi Gharib al-Hadith wa al-Athar 3/775]. The hadith means that faith is a deterrent to attacking others suddenly while they are unprepared. The Prophet’s words: “A believer is not to attack [others] by surprise” is a clear prohibition against deception in combat. • Permission to enter a country is considered a non-verbal security agreement not to cause corruption in the host country. Imam al-Khurqī said in his Mukhtasr: “Whoever enters enemy lands in safety is not allowed to cheat them of their money.” Commenting on this statement, Ibn Qudama said that it is prohibited to betray them [non-Muslims in non-Muslim countries] because there is an unspoken covenant to enter in safety on the condition that the person who seeks permission to enter a foreign country does not betray or oppress them. So whoever enters our lands in safety and betrays us violates this security agreement. This is prohibited because it involves treachery which is forbidden in our religion.” [Al-Mughn̄i 9/237]. • The enemy must be from among those whom Muslims are permitted to fight as compared to the enemy with whom Muslims have a truce. It is impermissible to attack the enemy under the cover of night because it is a violation of the security pact between them in terms of lives, wealth, and honor. • It is impermissible to use human shields save in a state of war and under specific conditions detailed by jurists. [Bahr Ra`iq 80\5, Hashiyat ibn ‘Abn Abdin 223\3, Rawdat al Talibin 239\10, Mughni al Muhtaj223\4, Mughn̄i ibn Qudama 449\8, 386/10]. Who Has The Right To Call For Jihad and Declare War? 1- The principle in war is that it should be launched with the authorization of, and under the banner of, the Muslim ruler; it is imperative that the decision to declare war be based on his own reasoning and his subjects must obey him. A ruler is authorized to declare war due to his knowledge of evident and hidden matters, the consequences of actions and the interest of his people. For this reason, a ruler is authorized to declare war and agree to domestic or international treaties as soon as he assumes office. In turn, he does not issue decisions based on [personal] whims. In the above verse, the term ‘contract’ refers to all commitments between two parties on a particular issue. In his interpretation of the above verse, the erudite Tunisian scholar, ibn ‘Ashur says: “‘Contracts’ in this verse refers to one of a genus denoting the totality [of contracts]. It includes covenants that Muslims made with their Lord such as to follow the shari’ah … pacts of allegiance between the believers and the prophet [pbuh], not to associate partners with Allah, steal, or commit fornication … agreements between Muslims and non-Muslims … and agreements between one Muslim and another” [Al-Tahriir wa al-Tanwīr, 6/74]. Amr ibn ̔Awf al-Muzna, may Allah be pleased with him, narrates that the prophet [pbuh] said: “Muslims are bound by the conditions [they stipulate] except those that are unlawful or those that make unlawful matters lawful.” [reported by al-Tirmidhi]. Commenting on this hadith, al-Jass said: “It is a general obligation to fulfill all the conditions man holds himself to as long as there is nothing (in Islamic law) to restrict them.” [Ahkam al-Qur`an, 2/418]. Ali, may Allah be pleased with him, narrated that the Prophet [pbuh] said: “The protection granted by the weakest Muslim to a non-Muslim is tantamount to that of the entire [community]. Whosoever violates it incurs the curse of Allah, the angels, and all the people.” [Reported by al-Bukhari]. Abdullah ibn ̔Umar, may Allah be pleased with them both, narrated that the Prophet [pbuh] said: “The signs of hypocrisy are four: when he is entrusted with something he betrays the trust, when he speaks he lies, when he makes a promise he breaks it, when he quarrels he behaves in an immoral manner. Whoever possesses all four is a hypocrite and whoever possesses one of them possesses an element of hypocrisy until he gives it up.” [Reported by al-Bukhari in his Sahih]. Umar ibn al-Hamq al-Khaza̔ī narrated that the Prophet [pbuh] said: “If a man entrusts another with his life and is killed by him, I have nothing to do with the murderer, even if the murdered man were a non-Muslim.” [Reported by al-Bayhaqi]. Consequently, the parties to international treaties and agreements are committed to end war and enjoy a state of peace by virtue of the agreement they entered into. Allah Almighty says: And if they incline towards peace, then incline to it [also] and rely upon Allah. Indeed, it is He who is the Hearing, the Knowing. [8:61]. The concept of “free choice” is central in the teachings of Islam as God stated in the Qur’an that “there is no coercion in religion”. Muslims grasped this concept well and realized that God does not want the mere submission of bodies but the real surrender of hearts. The heart is the main target of God’s Message because mercy is the all encompassing nature of Islam and the heart is where it resides. In contemplating these stipulations we would find that none of the current incidents of terrorism which happen to involve Muslims claiming to be performing Jihad are actually Jihad because they fail to meet any of the above laid out conditions. The sole aim of stipulating these conditions is to ensure that the concept of mercy and justice are at the forefront of the Muslims’ hearts and minds while conducting warfare. The aim of Jihad is not to steal people’s property or to shed their blood or to alter their values and force them to convert. The aim is to free people from persecution so they may have the opportunity to think freely and choose their religion based on informed decisions. All of these terrorist attacks have probably one thing in common: the cowardice of the perpetrators who betray and target civilians and cause nothing but the bloodshed of innocents; Muslim and non-Muslim. What breaks the heart the most is that while Jihad in Islam teaches Muslims to be noble knights who defend the rights of the weak and fight back against transgressors who are warriors in combat, today we find the people who claim that they are performing Jihad and attach themselves to this noble concept are those who are the furthest from Islam and Jihad in letter and spirit. The true noble knight Jihadist is the one who lays the foundation of justice and freedom for all people regardless of their personal religious convictions. Therefore, the concept of Jihad being a legitimate war is a true and well-defined one even by our modern definitions of just wars according to the United Nation’s charter on wars. The Prophet Muhammad (peace be upon him) was the role model who applied the different concepts of mercy, justice and freedom laid down in the Qur’an. He showed Muslims how to conduct and abide by these concepts practically. Before delving directly into the Prophet’s conquests and contemplating the way it which they were conducted and the aims that they strived to reach, we need to take a broader look at the concept of war in ancient times and how it is a social phenomenon that is as old as humanity itself. It is innate in human beings to preserve their lives and fend off death. The survival instinct causes human beings to defend what belongs to them even if this leads to struggle and combat in order to survive. This primitive level of fighting for the basic needs of life such as food or shelter can become more sophisticated and develop into a higher level of war, such as the wars that are waged for gaining freedom or restoring dignity or fighting oppression. Moving to the holy books and divine scriptures, namely the Torah and the Bible, we find that new reasons are being added to wage war; reasons that are more advanced in nature and more civilizational in purpose. These types of wars are not waged to secure food for the next day, they are waged with the aim of alleviating injustice and securing freedom of worship for all people and helping those who are helpless and destitute. Humanity has witnessed a shift in the paradigm of conducting wars, they now aim to move away from fulfilling the needs of the “self” towards fulfilling “divine ideals” for which people are ready to sacrifice their lives. This shift in paradigm of conducting wars continued in the tradition of Islam and took the name of “Jihad”. In Jihad one finds himself or herself more than ready to sacrifice his life for his religious beliefs and for fulfilling a higher calling that advocates alleviating injustice and persecution and establishing freedom of religion and thought. When the Prophet Muhammad (peace be upon him) immigrated to Madinah and established the nascent Muslim state after suffering 13 years of violent opposition and anguish, the tribe of Quraysh in Makkah was angry at the huge success that the message of Islam had achieved without coercion or bloodshed. The tribe of Quraysh felt threatened by the new power of Islam which would undermine their authority in Makkah where idol worship was the center of religious life and where Quraysh were the religious leaders whom people from the rest of Arabia would come to visit and present their offerings. Muslims patiently endured persecution for 13 years in Makkah and abided by the Prophet’s command to not respond to the aggression which they endured at the hands of the Makkan idolaters. When the Muslims immigrated to Madinah and established their new state, they found themselves in a position where they had to defend the boundaries of their nascent state against the attacks of Quraysh which hoped to destroy this new religion in its infancy. It was at this time that God permitted Muslims to fight back those who fight them and to protect themselves against aggression. This indicates that jihad in the sense of armed struggle was not a self- embedded concept which originated with Islam. It is more likely that the circumstances which the nascent Islamic state was born into gave rise to Jihad. These same circumstances surrounded the message of the Prophet Jesus who called the Jews to peace and reform yet they hunted him down and wanted to crucify him except that God saved his Prophet from his persecutors. Terrorism, therefore, cannot be the outcome of any proper understanding of religion. It is, rather, a manifestation of the immorality of people with cruel hearts, arrogant souls, and warped logic. Islam by its nature is a religion of moderation, not of extremes. In his famous saying, the Prophet of Islam advised Muslims to always choose the middle ground and not seek extremes on either side. This moderation in religion means that one neither exaggerates; transgressing the limits set by God, nor neglects them altogether, thereby falling short of His expectations. While calling upon all Muslims to exercise moderation with all permissible things, Islam clearly and categorically rejects all forms of extremism, including ghuluww (excessiveness), tanatu‘ (zealotry) and tashaddud (extreme practices). These forms of extremism do not find a home in Islamic teachings, because Islam recognizes that extremism is morally flawed and unproductive. It is against human nature, and has always been a short-lived phenomenon which does not work. The problem faced by Muslims today – and indeed religious communities across the globe – relates to the issue of authority. In both Islam and other religions we are witnessing a phenomenon in which laypeople without a sound foundation in religious learning have attempted to set themselves up as religious authorities, even though they lack the scholarly qualifications for making valid interpretations of religious law and morality. In many cases, they have been facilitated in this by the proliferation of new media and irresponsibly sensationalistic journalism. It is this eccentric and rebellious attitude towards religion that clears the way for extremist interpretations of Islam that have no basis in reality. None of these extremists have been educated in Islam in genuine centers of Islamic learning. They are, rather, products of troubled environments and have subscribed to distorted and misguided interpretations of Islam that have no basis in traditional Islamic doctrine. Their aim is purely political – to create havoc and chaos in the world. Unfortunately, terrorists often invoke the Islamic concept of “Jihad” to justify their crimes. This has led to much confusion and the tendency to misinterpret this important Islamic idea by linking it to violence and aggression. Military Jihad, by contrast, is the antithesis of terrorism. It is a just war of the sort that can be found in every religious law and civil code. As the Qur’an says, “Fight in the way of God against those who fight against you, but avoid aggression for God does not like the aggressor.” “But if they cease [fighting], then God is Forgiving, Merciful.” This statement has been repeated many times throughout the second chapter of the Qur’an and forms the fundamental parameters for the Islamic law of warfare: namely, that it is permissible only for the purpose of repelling an attack, and protecting one’s self, one’s home and one’s family. Terrorism does not come close to fulfilling any of the many conditions which are necessary for a just Jihad. Among these is the fact that war can only be launched upon the authorization of the Muslim ruler, after consultation with specialists and consultants. Vigilantism has been clearly forbidden throughout Muslim history. Similarly, terrorism involves killing people and taking them by surprise. The Prophet has instructed: “A believer is not to kill [others]. Faith is a deterrent to killing.” Similarly, he has said: “A believer is not to attack [others] by surprise.” Clearly, terrorists can only accomplish their goals by going against these Islamic teachings, which are fundamental to the type of chivalrous character Muslims must always exhibit, whether at wartime or during periods of peace. Moreover, terrorism kills and harms women and children. A tradition of the Prophet relates that a woman was found dead in one of the battles. The Prophet found out about this, and thereupon forbade the killing of women and children. Another phrasing of this hadith states: “The Messenger of Allah (pbuh) forbade killing women and children.” The great scholar of Islam, Imam al-Nawawi commented on this: “There is a scholarly consensus on acting on this tradition as long as the women and children do not fight.” It is clear once more that this is counter to the practice of terrorists. As such, it is clearly a mistake to label the terrorists practitioners of Jihad, or mujahidin. This is a lofty Islamic concept which bears no resemblance to the lawlessness practiced by terrorists. The word commonly used in modern Arabic for terrorism, irhab, though an improvement, also poses its own set of problems. Indeed, irhab and the related Arabic root (r / h / b) often contain positive resonances for those conversant with classical Islamic vocabulary. For example, the Qur’an uses a word in the semantic range spawned by (r / h / b) to explain the proper awe with which humans ought to relate to God. “O Children of Israel, remember my favor wherewith I favored you; and fulfill my covenant and I shall fulfill your covenant, and have awe of Me.” [2:40]. Similarly, the Qur’an uses a related word (rahban) to refer to monks and monasticism (rahbaniyya), and their manner of interacting with the Divine. Finally, and more concretely, the root (r / h / b) is used to refer to a praiseworthy deterrence against those enemies who would seek to aggressively intimidate the Muslim community. “Make ready for them whatever force you can and of horses tethered that you may thereby awe the enemy of God and your enemy.” [8:60]. This term therefore is often used to refer to a concept of deterrence aimed at securing an advantage that will lead to peace with an enemy that would otherwise transgress against the Muslim community. The term irjaf as the proper translation into Arabic for terrorism is more favored. “This word, which denotes subversion and scaremongering to bring quaking and commotion to society is derived from the root (r / j / f), which means to quake, tremble, be in violent motion, convulse, or shake.” This term occurs in the Qur’an in this context in one telling verse: “Now; if the hypocrites do not give over, and those in whose hearts there is sickness and they make commotion (murjifun) in the city, We shall assuredly urge thee against them.” [33:60]. In the context of this verse, al-Qurtubi, the renowned thirteenth-century Qur’anic commentator and Malikiījurist, explains the meaning of irjaf with respect to “shaking of the hearts (tahrik al-qulub),” noting the root’s corresponding application to “the shaking of the earth (rajafat al-ard).” Within an Islamic context, connecting this metaphor of creating commotion on earth (murjifun) with that of shaking hearts (tahrik al-qulub) connotes that those who do wrong are in fact acting against the wishes of the Divine. The term murjifun (singular, murjif), as well as the equivalent rendering irjafiyyun (singular, irjafi), is a far better translation of terrorists … Of course, there are multiple ways to bring about such intense commotion to society, but all of these fall under the term Irjaf. From a linguistic perspective, the term unambiguously connotes the cowardice, deceit, and betrayal associated with terrorism in striking from behind.